When I see the words 'reformed assassin', I immediately start to wonder just what reformed them and if the reformation will stick. I didn't have any cause to wonder with Cristan as what changed him was the love of his daughter and wanting her to grow up away from the life he had known. I found him to be an interesting and intriguing man that would only resort to violence to protect those he loves or women and children. He is the kind of man that a woman wouldn't mind meeting in a dark alley. Sarah is struggling to learn to live as a single mother and her violent ex-husband isn't helping matters as he plans to get her back under his control. I enjoyed watching her learn that allowing other people to help her out isn't admitting weakness. And I felt that she really deserved a chance with a decent man like Cristan. Now if only their pasts would leave them alone. 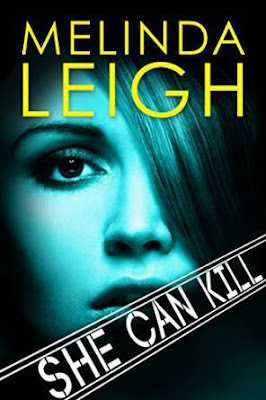 I really enjoyed SHE CAN KILL. The main characters, Cristan and Sarah, were people that I would enjoy calling friends and the secondary characters were well fleshed out and helped keep the story on pace. Speaking of pace, it was brisk and the tension built up nicely throughout. The villain from Cristan's past kept you guessing as to just who she was while Sarah's ex Troy was ever present. I would recommend this book to any of my readers who enjoy romantic suspense. It is part of a series and I am going to find the rest of the series so that I can get more of the secondary character's stories.